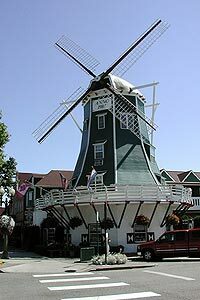 Lynden is a quiet farming community with strong Dutch roots. A 72 ft. windmill introduces visitors to this town that attracts people to it throughout the year. On Front Street, waitresses in authentic dress greet customers in coffee shop. During the Northwest Washington Fair each summer there is an increase in population. Lynden Pioneer Museum is one of the best museums in Washington, and possibly in the entire United States. Exhibits enticing visitors are the creation of Lynden in 1900 and a collection of antique buggies and haida artifacts from Queen Charlotte Islands. A premier Northwest destination resort, Homestead Farms has a links-style golf course in a residential community. Besides the championship golf course, a hotel with spacious rooms and condos, a fitness center, indoor/outdoor pool and great dining facilities greet those who come here. Claire VG Thomas Theatre on Front Street, in the Dutch Village Mall, serves as the town’s professional community. It opened in 1987. In August, check out the Northwest Washington Fair which features a carnival, agricultural displays, draft horse exhibition, concerts, vendors, and food. In October see the Lynden Harvest Festival & Antique Show. A quilt walk, pumpkin patch, giant hay maze, apple and cheese samples make fall special. Over 200 vendors display handmade treasures. Live entertainment offers more appeal. A lighted Christmas parade the first part of December starts out holiday festivities.